My Wednesday blogs are for pastors! Each Wednesday I will write a word for pastors, as well as church leaders. We can also learn something from one another as leaders, so here you go! In 1980, at an evening session of the Texas Baptist Evangelism Conference in Dallas, I heard the late and great W.A. Criswell challenge pastors to give their mornings to God. The following Sunday, I stood before the small church I pastored, the First Baptist Church of Milford, Texas, and announced to them my decision to give my mornings completely to God for prayer and study. All these years, I have lived by this firm commitment. So what do I do in this time with God? Over the years, on a typical day, my schedule has evolved into me typically getting up at 3:00 a.m. from Sundays through Thursdays. If I am traveling, this schedule is negotiated and, of course, Sunday is a very different kind of day due to responsibilities. On Saturday nights I usually struggle going to sleep, anticipating the day ahead. My goal is to be in bed with lights off by 10:15 p.m., if possible. My alarm goes off at 3:00 a.m. and I head into the family room, get a cup of strong coffee or green tea, my iPad, (on which I keep my prayer list), my Bible, and my journal. I begin in prayer, moving into the Word, interweaving with prayer, and journaling a prayer to God — which I’ve done daily since January 1, 1990. I am a big believer in having a spiritual journal. At 4:45 a.m. I jog on my treadmill for an hour, going over my sermon, praying through it, and talking through it aloud. This is where I move to mastering the sermon. After an hour on the treadmill, I call a prayer partner for a few minutes. I have called this man every Sunday morning since 1989, it is a practice I strongly encourage pastors to develop. I then eat a very light breakfast and head for the shower. By 7:35 a.m. I am on my way to church. After touching base with our leaders for ten minutes, I am in my office for prayer and additional study. By 8:40 a.m. I am on my way to greet church members and guests in an informal setting and by 9:00 a.m. I walk into a prayer room with several men who lay hands on me and pray for me. By 9:10 a.m. I walk into our worship center, greet more people, and begin the worship experience. At the present time, I preach two major services, one at our Springdale campus and another at our Pinnacle Hills campus. After the second service, Jeana and I greet people for at least 20 minutes, we usually leave the campus around 1:00 p.m. I may or may not have a luncheon, but whatever the schedule, I look forward to a brief nap in the afternoon. Again, the alarm goes off at 3:00 a.m. After water goes on my face and I grab coffee or green tea to help me start the day, I head to my home study. The first 90 minutes of my morning are spent in prayer and the Word devotionally. I reference a long prayer list on my iPad, which continually grows and is updated. I always end up in my prayer journal, writing a prayer to God daily. By 4:45 a.m. I am totally into my sermon preparation. I take this very seriously. For a pastor, there is nothing that is more important than developing your personal walk, followed by preparation to teach and preach the Word of God. From 4:45 a.m. until 10:30 a.m., with the exception of one hour for exercise and personal fitness, I am in study preparation. Sometimes I will respond to emails if it fits into the moment. If not, I wait. By 10:30 a.m. I am in the shower and by 11:30 a.m. I am on my way to a lunch meeting. Take Away for Pastors Today: Give Your Mornings to God! Giving your morning to God will transform your life and ministry. Nothing, and I repeat nothing, is more important than your own personal spiritual development and walk with God. It will transform your life and ministry. So pastors, devote yourself to a deep study time giving yourself to prayer and the study of God’s Word. Bible Studies for Life . . . Where The Bible Meets Your Life! There is nothing in this world more important than knowing how God’s Word applies to our lives. The living, vibrant Word of God transforms, deepens, develops and strengthens us for the Master’s service. It illuminates the thoughts and intents of our hearts so we might walk in God’s ways at all times. It lights our path, helps us to walk straight, and prevents us from stumbling. It is as sweet as honey to our lips. This is why I am excited to share about a new responsibility I have taken on related to a Bible study series called, Bible Studies for Life. In 2012, LifeWay Christian Resources was looking for an opportunity to involve church leaders in developing curriculum. 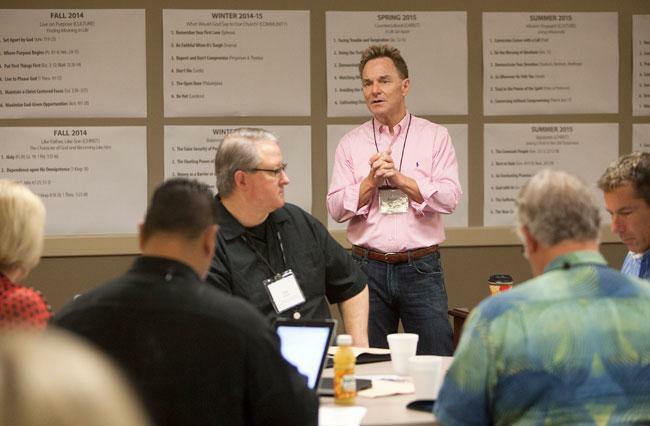 They asked me, a pastor, to take on the role of General Editor and to assemble an advisory council of church leaders to frame out a study that would be a response to a great need within churches today. It was a privilege to assemble 13 men and women in ministry, for whom I have tremendous respect, to explore how a Bible study could provide for the spiritual needs of today’s men, women, boys and girls. The result is the new Bible Studies for Life, a study created by churches for churches that meets people right where they are in life with biblical truth. LifeWay will be releasing studies for all ages for use in Fall 2013. Our desire through this study is to develop people who know Christ and His gracious work, who are contributing servants in the community of faith, and who can effectively engage culture without losing distinction. Bible Studies for Life is for people who want to know Christ. Jesus said, “This is eternal life, that they may know you, the only true God, and Jesus Christ who you have sent” (John 17:3). It is our goal with this series to see both leaders and learners know Jesus Christ deeper. By extension we want people to know Jesus Christ’s gracious work. There are yet many who do not know that the grace of God who brings salvation has appeared to all people. This series will help us explore and explain the saving, maturing, and keeping grace of God. Those who use Bible Studies for Life will get a fully biblical sense of what it means to be a part of a community of faith. How do I serve in my local church? What is my giftedness and what does God want to accomplish with it? These things are essential for bringing people from the edges of attendance to ministry. We know Jesus loved the church and gave Himself for it. We also know we are commanded to assemble together as His body, and even more so as we recognize the nearness of Christ’s return. Thorough Bible study prepares us to live in community around the Gospel. God’s Word cleanses us for fellowship and service, strengthening us and our faith family. Today, believers seem to have an ongoing struggle with exactly how to engage culture. Some fear to even try and some seem to fall headlong into the midst, nearly losing their Christian identity in the process. Jesus said that He would send out His disciples as sheep among wolves, and that we should be in the world but not of the world. Our ongoing challenge is how to live in a way that defines us as believers in Jesus while being close enough to unbelievers for them to both hear the Gospel and see lives empowered by it. Of course the key to all of this is that we study the Bible. This is not merely a study on helpful sayings for life, but what does God say about life? It’s through His Word that His grace informs and transforms us. I want to encourage you to follow this series closely as we study the Bible for life. In the meantime, you can preview and give feedback on the new resources at biblestudiesforlife.com. I know our team would appreciate hearing what you think.